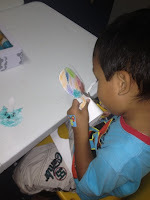 I cannot stress how important it is for young children to have hands-on practice in using scissors (in fact, I have written about this before). I have taught preschoolers and prekinders for a long time and it is frustrating for me to see teachers who will not give children a pair of scissors but will cut for them. I look at their classroom walls and it does not reflect the children's work. What stares back at me is a picture perfect wall where every line is cut perfectly. This is not children's work. 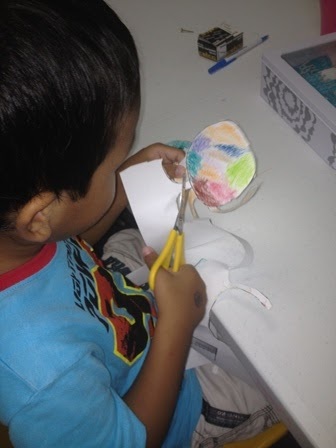 Imagine how the children would feel when they look at their work that they have not completed themselves. Now imagine how they would feel when they look at their work that they have completed by cutting it out, even though the lines are crooked or the leg has been taped back on. There are many a times when children feel proud of their work when they have done it themselves even when the result is less than sterling. I have spoken to teachers about letting children cut for themselves and their main fears are that children will hurt themselves and that a mess will result. There's no doubt about it but it will be messy. 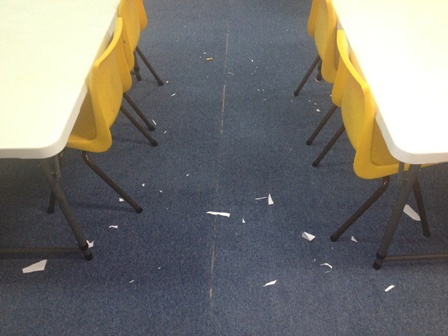 I always make sure that there is some sort of cutting everyday and by the end of it my floors are covered in tiny bits of paper! But this is about the children learning and not about how tidy my room is. Children are such quick learners if we let them be. The children who come to me with limited scissors skills, masha Allah, usually gains mastery in about 3-4 months. This is my room at the end of the day. It is messy but at least I know the children are improving their scissor skills. Pre-scissors Stage. This is children's first experiences with scissors. They will automatically use two hands to open and close the scissors to cut. Controlling the scissors. At this stage children need to handle the scissors. They need to get used to holding it and to open and close the scissors with one hand. 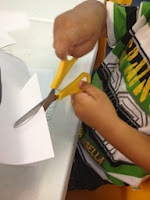 At first, let them experiment with the different ways that they can hold the scissors. Let them experience the frustration of not cutting the paper when they are not holding it correctly. You can then model how to hold the scissors properly. This takes a while for them. 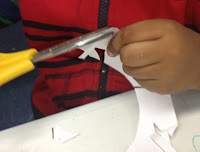 Start first with safety scissors that does not have a blade and a piece of paper. 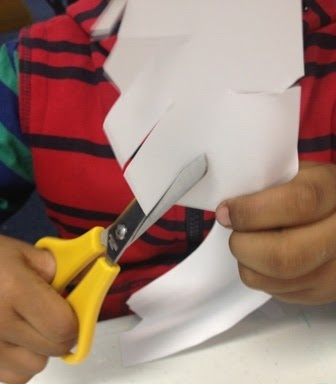 What children will tend to do first is to make little snips along the edges of the paper. One snip. When children can snip the edges of a paper then give them strips of paper about 3-4 cm wide and safety scissors with a blade. This will give them the confidence that they can cut something off. Along a straight line. Draw thick lines across a page and ask children to cut along the line. This will give children practice in cutting continuously instead of little snips. A curved line. Draw curved lines across a page. This will give children practice in cutting smoothly. A zigzag. Draw a zigzag across the paper. This will give children practice in moving the wrist of the scissor hand. Shapes. 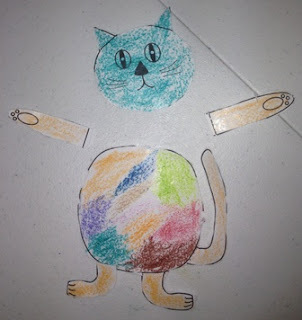 Draw large shapes onto paper and ask children to cut the shape out by cutting along the lines. 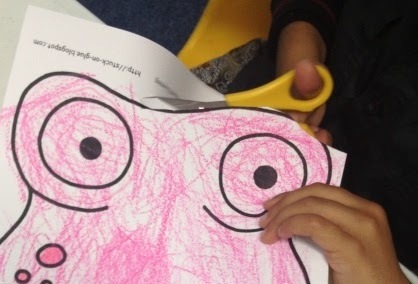 This requires children to move the paper to change direction instead of twisting the scissor-hand to change direction. Children have to realise that when we cut we keep the scissor hand still, only moving the wrists from time to time instead of the whole arm, to change direction. What we move is the hand that holds the paper. Pictures: When children can cut out pictures then they have mastered the use of scissors, insha Allah. Look at how focused the child below is. He is only 4 years old but he could cut perfectly, masha Allah. He did this all by himself. Most children at this age would find it difficult to cut the feet and tail (because it is attached to the body and requires a lot of manipulation and fine cutting. 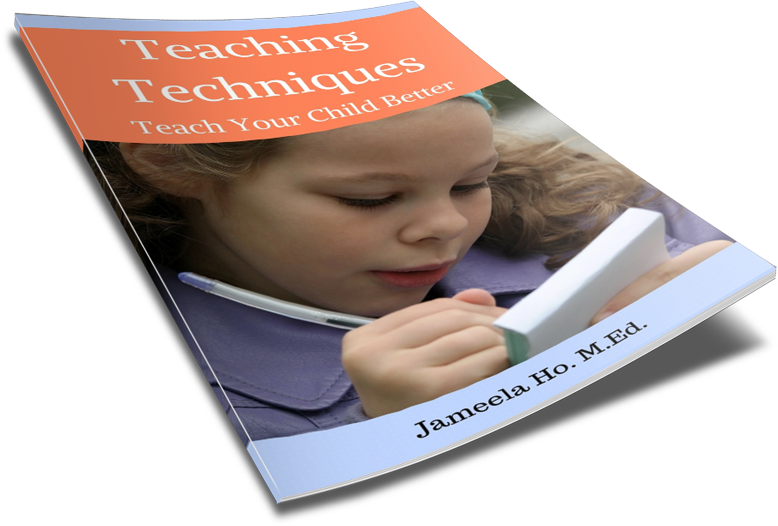 Below are some books that you might like to use to provide children with things to cut. There are some great links in that site. Jazakallah for the link. I hadn't thought of taking pictures. That's a good idea. It's near the end of the school year here in Australia so all my kids can cut. InshaAllah I'll try to take some pictures next year as the new children progress and update this post. I have added some pictures of my preschoolers who are 3 and a half year olds. The first 3 pictures are of a child who joined the class recently. When he came he couldn't hold scissors at all. The last picture is of a child who joined the class about 4 months ago.